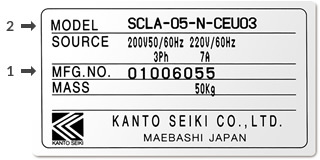 Repair Request || After-sale Service || Kanto Seiki Co., Ltd. When you want to get more detailed information or request repairs, please contact the service station in your country. If there is no service station in your country, please contact the manufacturer of your machine or the trading firm or agency that sold you the machine. If neither means of communication is available, please contact our head office in Japan. When you request a repair, please prepare the following four information. For (1) and (2), please see the serial number plate located on the upper right side of the Oilmatic main body.